In our Gospel this morning, John the Baptist preaches about justice. Simply put, justice means giving another what they are due, what they are owed. Justice is all encompassing - it should exist between men and between God and man. John the Baptist states that in justice between men, the naked and the hungry should not go without clothing or food; tax collectors ought to be honest and soldiers must not take advantage of the very people they are charged to protect. It means that those who maintain public positions, have a particular obligation and an opportunity to serve society and not to obtain personal goods at the expense of those they are charged to care for. For those who live more private lives, it means that God will ask us if and how we cared for those who are less fortunate than ourselves - if we made ourselves a gift to others by giving of our time and our talent. It's not enough to merely write checks and give money - there is no replacement for the personal contact that we can give to others when we seek out those who are on the fringe of society. Interestingly, none of us has to look too far to find such persons. They could be in our very families, our offices, our parish. Persons in our society don't suffer as much from material poverty as they do from a spiritual poverty and they hunger for persons like you and me to be Christ to them - to show them the mercy and love of God. John the Baptist challenges each person to seek a deep and profound interior renewal in and through their work, their studies and in their daily routine. In God's eyes, there are no second-class jobs - all activity done as an act of love is the human person's primary way of seeking holiness in the world. Bl. Mother Theresa used to say that we are not asked to do great things - just little things with great love. When we apply ourselves to our work; when we work an honest day; when we use our work to perfect our God-given skills - that is when the justice of the Kingdom of God is being realized in our world. We ought to become holy through our work, not in spite of it. Notions of justice extend into our relationship with God as well. Perhaps we don't think of it in this way, but what we do here in this church on Sundays and every day of the week - the practice of religion - that is justice. Why? The word religion comes from the Latin religare - which means to reconnect. In the word religare, you hear the root for a similar word, ligament, which connects muscles and bones in the body. "Religare," from where we get the word "religion" means to reconnect or re-bind the human person with God. So, justice even involves our giving God what we owe Him - due honor and praise on the day that He has set aside for this very purpose - Sunday. In your bulletins this weekend, you will notice that Fr. 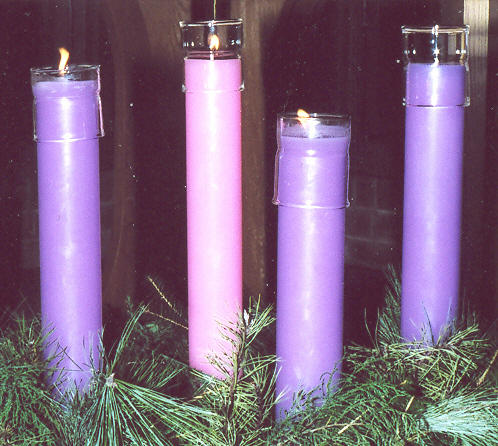 VanderWoude has included an Examination of Conscience for your use this Advent Season. Repenting of our sins, making a good confession and approaching Holy Communion free of all mortal sin is yet another way that we give God what we owe Him - a pure heart and a clean conscience. This is another form of justice. I always counsel people to come to Confession as often as they get an oil change. For most people, that works out to every 8-10 weeks. If we're willing to wait 30 minutes to have our car checked-out by the J-Team at Jiffy Lube, than what is stopping us from getting our soul's cleaned up by the best J-Team out there - those who absolve sins in the name of the Lord Jesus. When you go to Confession between now and Christmas, accuse yourself of all of your sins - don't hold anything back. Give the devil no reason to accuse you of withholding your sins in Confession, which actually is a sacrilege. Some of you may remember the Baltimore Catechism's explanation of this. In the first frame, you have a man who enters the Confessional with 3 mortal sins in mind. In the second frame he knowingly confesses only 2 of them - in order words, he intentionally does not confess the other sin. In the third frame, we read, "He who walks into Confession with 3 mortal sins but knowingly only confesses two of them, walks out of the confessional with four mortal sins." Of course, if you accidentally forget a sin, don't worry about it - God forgives all of your sins, even the ones you forget. However, God will not forgive someone who doesn't want all of the sins they can remember to be forgiven - God never imposes his mercy on us. As much as we take to heart the message of John the Baptist, we should also take a moment to consider the saint himself. This past Monday, Catholics all over the world gathered for the solemnity of the Immaculate Conception - a universal holy day of obligation. On that day, we considered the Blessed Mother and her total singleheartedness in drawing all people to her Son. The same is no less true for John the Baptist. The Gospel tells us that all were asking in their hearts whether John the Baptist was the Christ, the anointed, the Messiah. The Baptist's response is profoundly beautiful. Not only does he claim unworthiness to loosen the sandals of the real Messiah, a task reserved for the lowest of servants, but that the Messiah, who is mightier than John will baptize with more than merely water - but with the Holy Spirit and fire. What did he mean? We should first note that St. John the Baptist does not limit himself to preaching only penance and repentance - he exhorted all persons to seek baptism. His baptism was a way for his listeners to make interior preparation in order to help them realize that the coming of the Messiah was imminent. By stating that it is the Christ who will baptize with the Holy Spirit and fire, John is explaining to the people that his baptism by water alone does not have the efficaciousness as the baptism of Christ who will establish baptism as a sacrament. Christian baptism, instituted by Christ is the primary sacrament of initiation which forgives sins and bestows sanctifying grace. The use of the word "fire" is a metaphor to show the effectiveness of the Holy Spirit's action in totally wiping out sins. Fire is also a sign of the life-giving power of grace in the person baptized.